Jordan Macpherson, 29, enjoyed a win in front of her hometown crowd after a tight race for top honours in the 2018 National 1.40m Junior/Amateur Jumping Championship, presented by Dominion Regalia, on Nov. 4, 2018 at the Royal Horse Show in Toronto, ON. “The Royal is always such a great event, and it’s always great to win, but it’s even better when you win at The Royal,” said Macpherson, who took the title aboard Fiestamunde, an eight-year-old Dutch Warmblood mare owned by Sved Stables. Together they accumulated 11 points across the three classes of the division. Susan Horn, 34, of Bolton, ON finished just one point behind to earn the Reserve Champion title on 10 points aboard Egano van het Slogenhof (Electro x Nagano), a 14-year-old Belgian Warmblood gelding owned by Kingsfield Farm. Macpherson first took to the Coca-Cola Coliseum on Nov. 3 for the $2,500 Junior/Amateur 1.40m Welcome Stake, which featured a strong field of 19 horse-rider combinations. Course Designer, Alan Wade (FEI Level 4) of Ireland expertly eased the competitors into The Royal atmosphere with a straight-forward track that saw 13 advance into the jump-off. 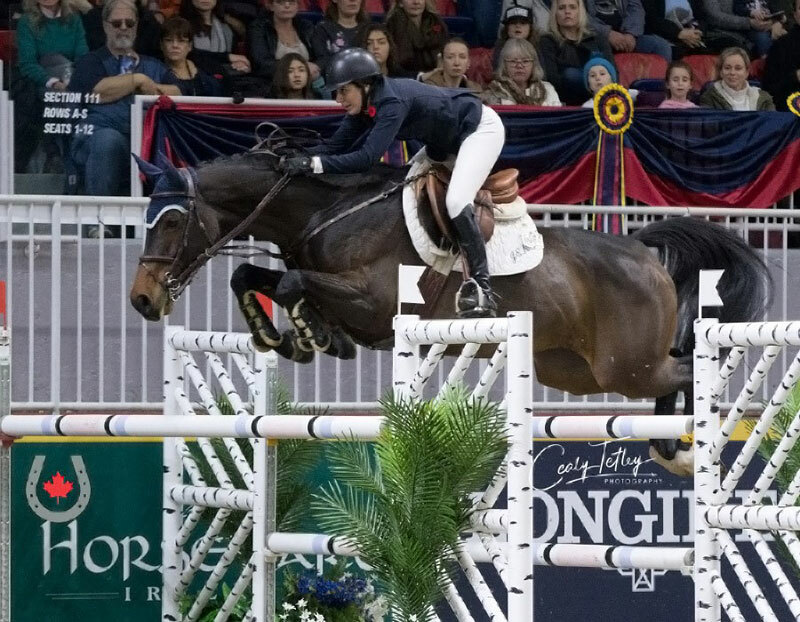 The second rider to contest the jump-off, Macpherson put in a quick time of 33.91 seconds, but had a rail at the first element of a double combination for four faults and eighth place. Only three riders went clear in the jump-off, and ultimately Chanelle Sjolander, 21, of Oakville, ON won on a time of 30.91 seconds with Cuenta Atras (Clearway x Lesotho), her nine-year-old Holsteiner gelding. Horn ended the first day of competition in fourth place after a lightning quick jump-off where she took daring turns and sliced angles to the jumps with Egano van het Slogenhof. Despite achieving the fastest time of 26.96 seconds, Horn lowered the second fence on course to add four faults to her score. The following day, the field returned for the final two classes, which kicked off with the $2,500 Junior/Amateur 1.40m Speed in the morning. Wade amped up the challenges on the course, consisting of 11 obstacles and 13 efforts, and provided plenty of options for inside turns – albeit with the risk of adding four seconds for each rail lowered. Just six riders had foot-perfect performances, and Horn proved to be the fastest, guiding Egano van het Slogenhof through every inside option for a smooth and efficient trip in 58.62 seconds. Macpherson took third by just fractions of a second, stopping the clock at 59.97 to finish just behind Mackenzie Wray, 19, of Loretto, ON, who had a time of 59.89 seconds with Jewel LVP (Berlin x Contender), a nine-year-old Belgian Warmblood mare owned by Makim Holdings Inc. The group returned in the afternoon for the $10,000 Junior/Amateur 1.40m Stake, where Wade pulled out all the stops with a technical track that resulted in just four riders advancing to the jump-off. This time it was Macpherson who prevailed, laying down a clear trip in 39.38 seconds to win by a margin of over 10 seconds. Sara Tindale, 16, of Campbellville, ON had the only other clear jump-off round, piloting Tindale Farms’ 10-year-old Dutch Warmblood gelding, Djibab van de Linthorst (Nabab de Reve x Amethist) to a time of 49.91 seconds for second place. As the national champion, Macpherson was presented with the Canadian Junior/Amateur Championship Plate, donated by the Equestrian Canada (EC) Jumping Committee in memory of Andre Bollinger. Looking ahead, Macpherson has her sights set even higher for Fiestamunde in 2019. For more information on the 2018 National 1.40m Junior/Amateur Jumping Championship, and full results, visit www.royalfair.org. 6th / Mackenzie Wray / Loretto, ON / Jewel LVP / Makim Holdings Inc.
2nd / Mackenzie Wray / Loretto, ON / Jewel LVP / Makim Holdings Inc.
7th / Veronica Bot / Burlington, ON / Quidam’s Caprice M / AEI Corp.
4th / Veronica Bot / Burlington, ON / Quidam’s Caprice M / AEI Corp.